Quicksilver (Pietro Maximoff) is a fictional Character that appears in comic books published by Marvel Comics. 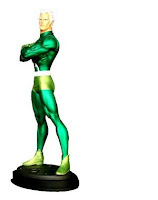 The character first appears in X-Men (March 1964) and was created by Stan Lee and Jack Kirby. He is the son of Magneto, the twin brother of the Scarlet Witch, and the paternal half-brother of Polaris. Debuting in the Silver Age of comic books, Quicksilver has featured in four decades of Marvel continuity, starring in the self-titled series Quicksilver and as a regular team member in superhero title the Avengers. 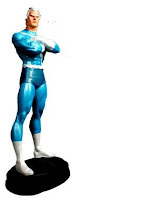 The character has also appeared in other Marvel-endorsed products such as animated films; arcade and video games; television series and merchandise such as action figures and trading cards - More about Quicksilver (Marvel Comics) Character Review..keep reading !! 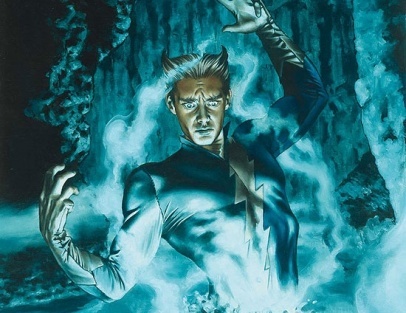 In 2006, IGN named Quicksilver #23 on their list of "The Top 25 X-Men Of All Time" commenting that "Quicksilver was the shining example of a villain turned good." Quicksilver is a mutant capable of moving and thinking at superhuman speeds. Originally capable of running at the speed of sound; exposure to the High Evolutionary's Isotope E made it possible for the character to run at supersonic speeds of up to Mach 5 and resist the effects of friction, reduced oxygen, and kinetic impact while moving at super-speeds. The character's speed allows him to perform feats such as create cyclone-strength winds; run up walls and cross bodies of water. It has been revealed that one of the reasons for his abrasive and impatient personality is that it seems to him that the rest of the world is moving in slow motion and that he is constantly waiting for it to catch up. As he once explained, "Have you ever had a day where you are at the ATM and you are in a hurry because you're running late but the person in front of you doesn't know how to use the ATM and they're taking forever? Now imagine what it must be like to spend every day surrounded by people who don't know how to use the ATM." Quicksilver loses his powers of speed when his sister alters reality, but gains new powers courtesy of the Inhumans' Terrigen Mist. The mist gives Quicksilver the ability to displace himself out of mainstream time and space and "jump" into the future. The character can summon several time-displaced duplicates of himself and appear to teleport by "jumping" into the future and then returning to the present at a new location. By voluntarily embedding fragments of the Terrigen Crystals into his own body, the character could empower former mutants with extreme versions of their superhuman abilities. The effect, however, was usually fatal. The crystals are subsequently forced from the character's body by the mutant Rictor, leaving him without these abilities. Quicksilver inexplicably regains his mutant superspeed powers after having a series of hallucinations. 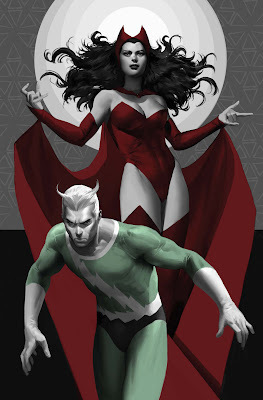 In May 2013, Entertainment Weekly reported that Quicksilver and his sister, the Scarlet Witch, would appear in the 2015 Avengers sequel (The Avengers 2).